Mix the amaretti with the butter. Line the bottom of 6 serving glasses with this and refrigerate until needed. For the custard, heat the cream in a small saucepan until just boiling. Whisk the yolks and sugar until smooth. Slowly pour half the hot cream into the yolk mixture, whisking vigorously and constantly. Gradually pour the yolk mixture back into the remaining cream mixture, whisking vigorously. Continue to cook, stirring continuously, until the mixture coats the back of a wooden spoon. 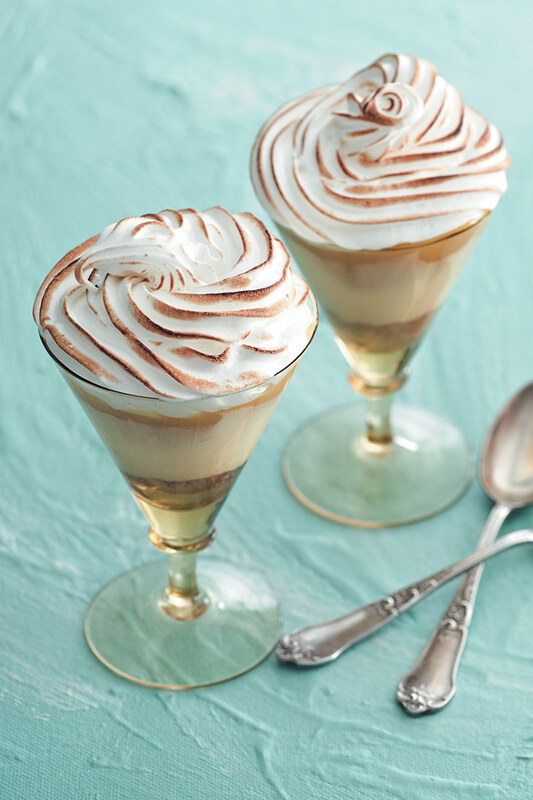 Pour the custard over the amaretti base in the serving glasses and refrigerate again for 30 minutes. For the meringue, beat the egg whites and salt until soft peaks form. Gradually add the sugar and beat until stiff and glossy. Preheat the grill. Spoon the lemon curd over the custard and top with the meringue. Place under the grill until browned, about 2 minutes, or brown with a blowtorch. Refrigerate for 20 minutes before serving.